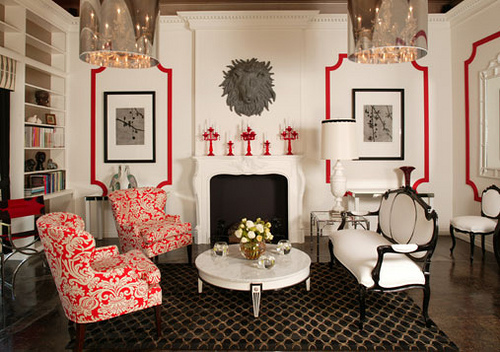 This is it – 100 percent over the top – Hollywood Regency design revival in full bloom. Always opulent and ever eclectic, always theatrical and expectedly daring, this style is not for the faint of heart. Captain Milktoast does not get a ticket to this show. Sometimes this style is brushed with whimsy and fantasy , like in the abundant use of light fixtures as seen in the photo. But you have to admit, it is dazzling. Well, name something glamorous and it was in! Clean architectual lines were paired with the frill of rocco. And, of course MIRRORS MIRRORS everywhere. 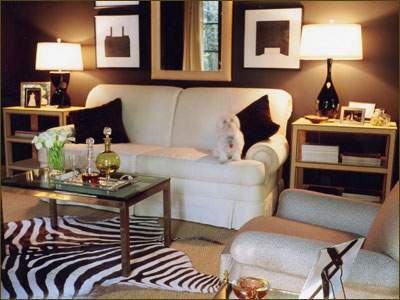 Global Views is a company favored by Phelan’s for their wonderful selection of mirrors. At High Point market they introduced an elegant montage of 7 octagaonal mirrors, finished in black lacquer and edged in silver, AKA: Regency revival. Today the revival is just as bold and as fresh as ever, not to mention terribly interesting! Scroll down to the previous post and you’ll see another interpretation from the swank unrestrained era called Hollywood Regency. Hollywood Regency never misses an opportunity for the drama of a luxurious, confident environment. HOLLYWOOD GLAM, GLITZ, and BLING! The photo of the week is pure inspiration! Hollywood Glam uses design elements borrowed from everybody! You know what I’m bloggin about – like the stars borrow jewelry! I chose this grouping because it illustrates perfectly everything we have been talking about for the last two weeks. We see the flamboyant bombe chest done in silver leaf with those dainty little French legs. Pure GLITZ! 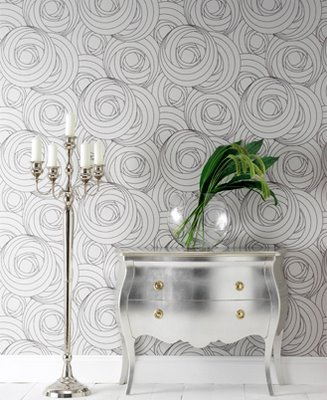 Bold black and white graphic roses on the wallpaper couldn’t be more fun. Unadulterated GLAM! Add a chandelier and you have BLING in furniture! Just study this picture and let your design thoughts soar. Next week I will define Hollywood Regency, which is a bit more upscale and contained, but you will see the outrageous fantasy of of all those who partake in this period. Here’s to the long holiday weekend! Rearrange your furniture or hang a chandelier! Without the rug this room borders on boring! A ‘Hair on Hide” rug is a cowhide that has been printed with the image of an exotic animal. No one has killed a zebra here!